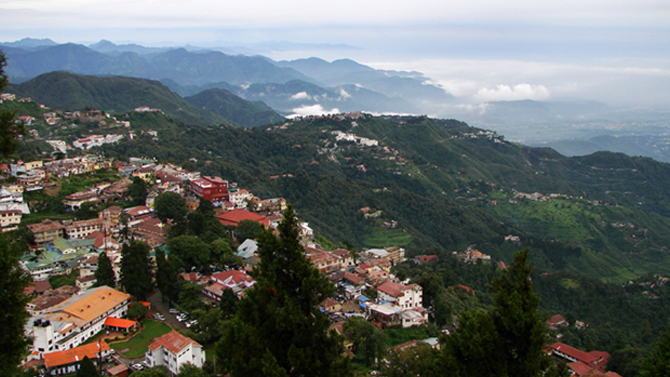 There is a reason why Mussoorie is called the ‘queen of the hills’. Incredibly beautiful, the hill station looks right out of a fairy tale –rolling mountains, cool pure air, the endless horizon in the distance, you simply get blown away by the sheer contrast it offers from life in a metro. The air also sings beautiful notes in your ear, telling you to take your time and don’t rush while you try to take in everything you have on offer! Interestingly, as you go up and up –the average altitude is 1,880 m, while maximum elevation is 2,290m –you can almost feel the peace that you feel from the inside. The place is famous for its trekking trails like Bhadraraj Temple trek, Benog Hill Trek, and George Everest Park which bring in tourists in large numbers. The place is a favorite haunt of people from all walks of life as it has something to offer for everyone. 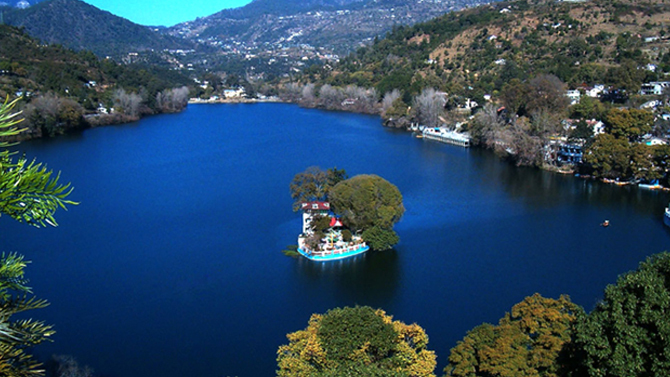 Whether you are a college student, a newly married couple or a hard-core professional, Nainital would reinvigorate you and send you back a happy soul. The hill station is surrounded by lush green hills from all sides and there is a beautiful lake right in the center around which most of the activities happen. Known as Naini Lake, it offers boat rides that ply on its greenish-looking waters; the main market is set bordering the lake from one side. At the market one can different items related to local culture, and art and craft. Tourist places like Sher-Ka-Danda Ridge, Guano Hills, Tiffin Top, and Eco Cave Gardens are within driving distance of Nainital. When in Nainital, you can even go spotting popular animals like the like snow leopard, Himalayan black bear and steppe eagle. 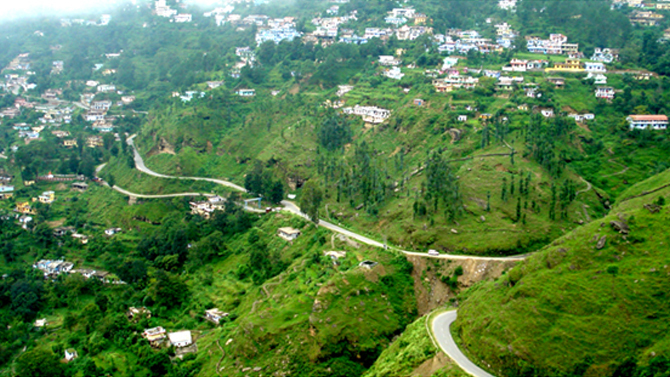 This hill station is actually a Cantonment town which is located in the district of Almora in Uttarakhand. Easily one of the most recognizable names in the tourism circuit, Ranikhet has a lot of things working for it, like there are many vantage points from where the scenery looks out of this world. It is located at an elevation of 1829 m above sea level and is covered with gentle hills and thickets of coniferous flowers; the forest cover is also substantial and is home to rich varieties of flora and fauna. The military museum is a must-visit attraction in Ranikhet while many love to go for long walks while soaking up the views of the mountains that are draped in a blanket of snow and enjoying the slap of the balmy air. 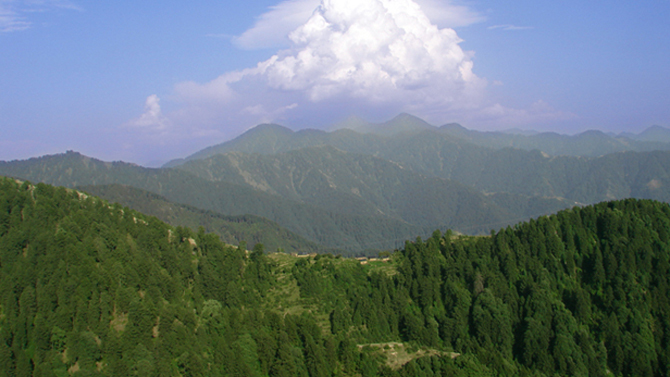 Situated at an elevation of 1370 meter above sea level, this hill station is some 22 km away from Nainital. 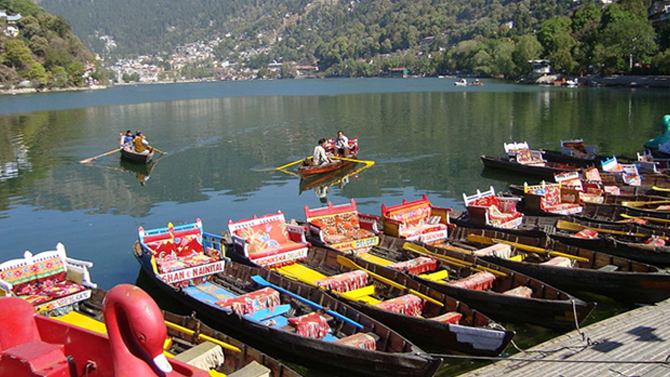 The major attraction here is the Bhimtal Lake with a beautiful lake right in the middle of it. The lake is overlooked by the stunning Himalayan Mountain which keeps a vigil over the place. Just beside the lake, there is an ancient temple called Bhimeshwara Mahadeva Temple; the temple if believed to have been built by the Pandavas while they were spending their time in exile. The salubrious climate that prevails in the region –summer temperature stays between 15 °C to 29 °C, while in winter temperatures get milder 4 °C to 18 °C –make it all the more appealing. 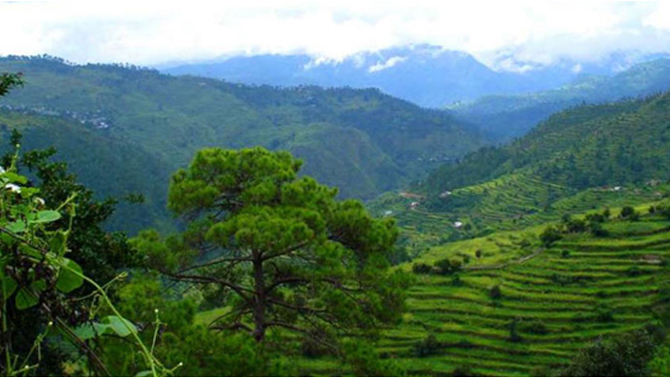 This beautiful hill station is perched at an elevation of 7600 ft above sea level, and holds the distinction of being the highest hill station in the whole of Kumaon. The hill station is rimed by the Binsar Wildlife Sanctuary which gives the weary traveler many Kodak moments to capture in their cameras. Visitors are advised to travel to Zero point as from this point panoramic views of the Himalayan peaks look as good as anything. Nature travelers in particular would love the place as the landscape is covered with thick Himalayan oak and rhododendron trees. Wildlife lovers can spend as much time they want in the company of animals like the leopard, black bear, pine, and marten porcupine, as well as more than 200 species of birds that can be found in the Binsar Wildlife Sanctuary. Another place of tourist attraction in Binsar is the Bineshwar Temple, which was built in the 13th century. If you love the freshness of a hill station and want to get lost in its encompassing beauty, Chamba is tailor made for you. The place is a nature lovers dream and is home to no less than five wildlife sanctuaries and five lakes, in addition to a number of Hindu temples. Go for a nature walk, and you can hear the balmy air singing soul stirring music and smell the unforgettable aroma which pales anything that you ever experienced. The wind can get chilling, but with such beautiful scenery in front of your eyes it is not much of a distraction; in fact after getting used to it, you will come to like it, especially as it helps you realize you are well and truly in the arms of nature. When the temperature goes below freezing point, the region is carpeted in a layer of white as snow takes over most of the region. For adventure freaks, the closeness of the River Ravi is a bonus as they can go rafting there. Many call it ‘Mini Switzerland’ and when you see it, you will know why. An adventure hotspot that is frequented by freaks from across the world, Chopta is a trekking paradise. 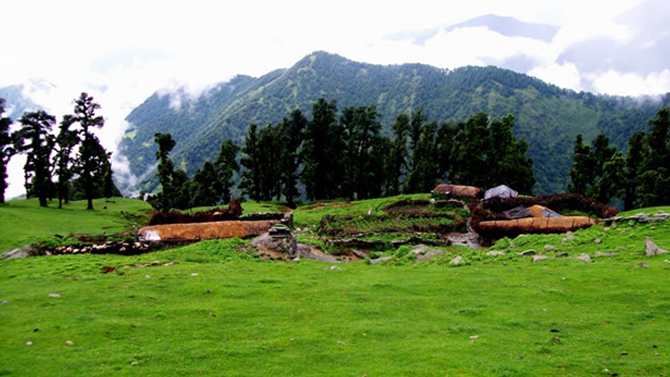 The most famous trek in Chopta is the Chopta Tugnath Trek, which is made up of easy gradients and is suitable for families and first timers. During the trek, which begins from Chopta and culminates in Tugnath summit, one gets to savor the stunning views of peaks like Panchchuli, Nanda Devi, Nilkanth and Kedarnath. The unspoiled beauty, snow-covered mountains, tall lush trees, and meandering valleys, all weave a magic spell on the visitor. The best time to visit Chopta is from September to November. Places mentioned above are picture perfect. Make your way to these fascinating hill stations when on a trip to Jim Corbett Park.